It could be said that culture developed as an antidote to the dreariness of a Shetland winter’s day. Whatever the reason, experiencing today’s island culture of music, literature, woollen and craftwork demonstrates that it has a unique tradition, but still feels quite cosmopolitan. Shetland music now circumnavigates the globe carrying with it the spirit of light, romantic hearts. It is a meld of the ancient and the modern, just as the population. 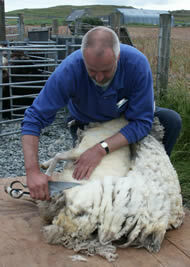 Sadly, Shetland wool and knitwear have suffered by losing much of its distinction and most of its provenance. Although tremendous artistry still is to be found in the islands, ‘shetland’ has become a ‘style’ and a commodity ‘type’. Reclaiming the name and authenticity of real Shetland wool is our goal. The Pictish culture left only intriguing carvings and inscriptions as the immigration of Viking settlers subsumed everything before it. Shetlanders down the ages have never been willing to accept entirely their role as part of the UK. They crave to be different, even as far as to invent their own traditions based loosely on Norse tradition. The culture of the land and the sea is that of the one people. 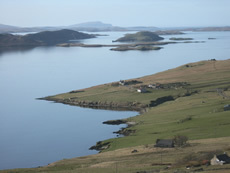 Shetlanders were fishermen with farms, superstitious and whimsical. The oral transmission of history was as in other Nordic countries, the means of entertaining whilst keeping in touch with ones roots. Introduce a fiddler and dancing, and you have what still happens today. Sheep were always seen as the ‘free spirits’ of livestock. They could never be domesticated in the same way as cattle. They would accept feed, reluctantly, but always retain the ability to survive without Man. The flocks grazing the hills were owned by the farming tenants or as they later became known as crofters. Each owner had his own set of ‘lugmarks’ on his sheep. Hills were gathered several times a year, a task carried out by whole communities. Sheep were ‘rooed’ or plucked of their wool. Wool was vital for clothing, and in earlier times, the weaving of ‘wadmel’ for paying taxes to Norse landlords. Knitwear and its uniquely Shetland style became a commodity during the 17th century with sales of socks to the Dutch fishermen. Over the centuries styles became more ornate, creative and some knitters began a move from commodity production to the creation of indigeneous knitted folk art.